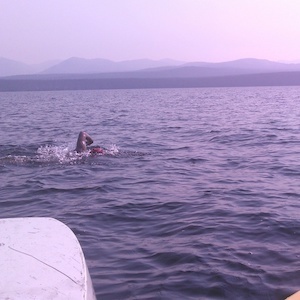 Lengthwise crossing of Yellowstone Lake, Wyoming: mouth of Yellowstone River to Trail Creek Patrol Cabin, Southeast Arm. Start: September 3, 2017, 07:11 (Mountain Daylight Time). 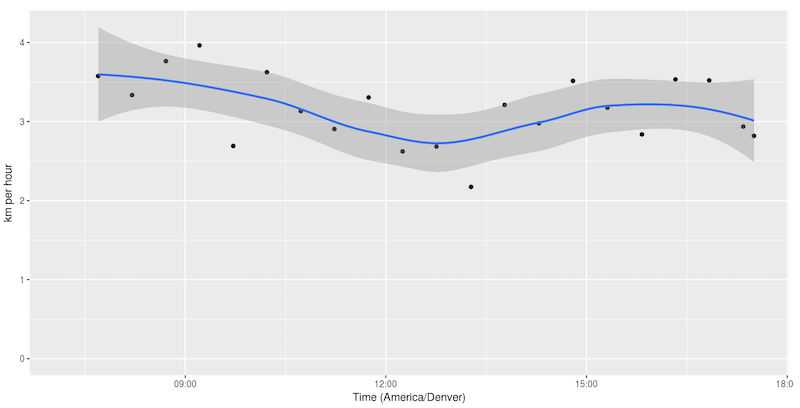 Download data (CSV, 1-min frequency). 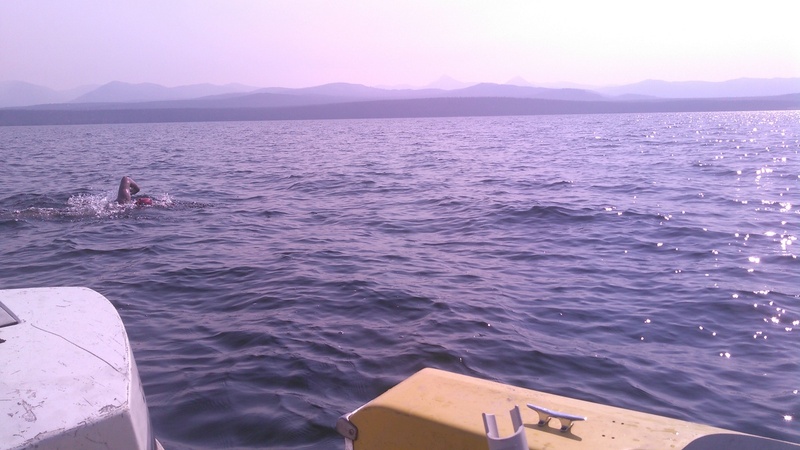 On Sunday, September 3, 2017 Pareesa Goshtasebi, Justin Whaley and myself set out to begin an expedition to swim from the north side of Yellowstone Lake to the south. Yellowstone Lake is situated in Yellowstone National Park in the state of Wyoming at an approximate elevation of 7,730 feet. It stretches 20 miles in its longest direction from the Fishing Bridge to where the Yellowstone River enters into the lake. After passing under the Fishing Bridge, the Yellowstone River continues down through the Grand Canyon of the Yellowstone, through Montana to the Missouri River and eventually to the Gulf of Mexico. It is the only river in the lower 48 states which is undammed and untamed and Yellowstone Lake is a natural body of water. Where the river flows out of the Thorofare and mountains to the south east, it dumps into one of the world’s great supervolcano calderas approximately 15 miles away from arguably the most remote point in the lower 48 states (Hawk’s Rest near the start of the Thorofare). Bracketing the mouth of this lake are two ranger cabins on the Southeast Arm. The first is Cabin Creek Patrol Cabin, which sits on the Thorofare itself and the second is Trail Creek Patrol Cabin, which sits on the lake. The lake is known for its cold temperatures, high altitude, geothermal activity and exceptional fishing. Before the introduction of Lake Trout in the late eighties, the cutthroat trout population was so thick that they “could be caught in mule loads by wading out a few feet in the open waters at any point with a grasshopper bait. Two men could catch them faster than half a dozen could clean and get them ready for the frying pan.” (Lieutenant Gustavas Doane, 1870). One of the major cutthroat spawning grounds is the Fishing Bridge at the lake outlet. When looking into the waters, many small fry can be seen swimming around and the water is clear enough to see to the bottom across the whole river. The ice on the lake typically breaks up in May and the lake is known for having unpredictable and sudden strong winds with late afternoon thunderstorms. The wind typically blows out of the southwest and water temperatures typically peaks in late August at around 60 degrees Fahrenheit. 2017 was a remarkably warm year, where the normal late August and early September north fall winds had not swept down yet by Labor Day. This pushed the lake temperature up to 62 degrees during the heat of the day on September 3, 2017. Given this history of the lake and its exceptional beauty, I took it upon myself to make an attempt at swimming across it. I had originally planned to do this in 2016 on the 100th anniversary of the Park’s induction into the national park system as the first National Park. I purchased a small 15-foot boat with a 90 HP outboard motor and began trial testing it. It was woefully unprepared for such a journey. Its steering was loose, it did not start regularly, its electrical system needed work, it didn’t have any of the gauges (Fuel, speedometer, compass, fuel expenditure, radio) etc. that would be needed to cross this lake and there were very few redundancies built into it. 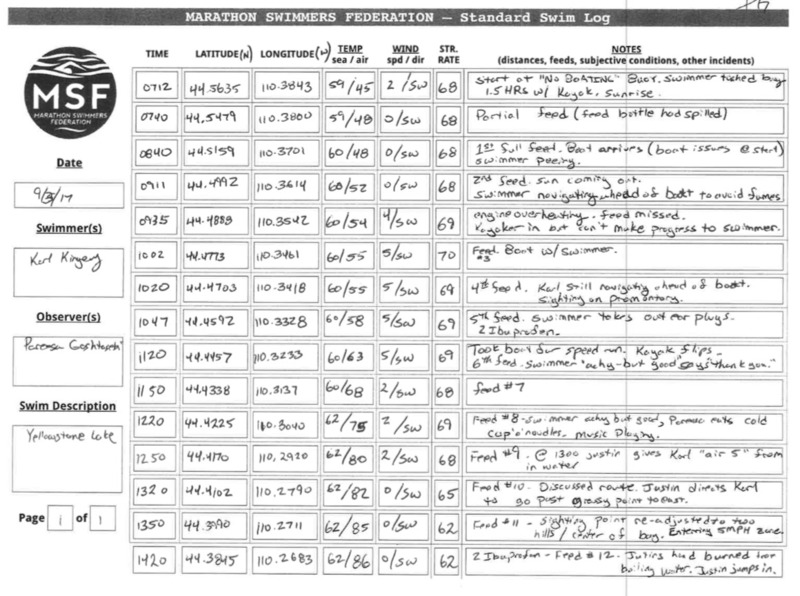 Faced with the realization that undertaking the swim would be unsafe and foolhardy, the 2016 swim was cancelled and the next year was spent outfitting and repairing the boat. A backup 2HP outboard motor was acquired, gauges were purchased and mounted, the motor was repaired and the idle adjusted, and the electrical issues were corrected. 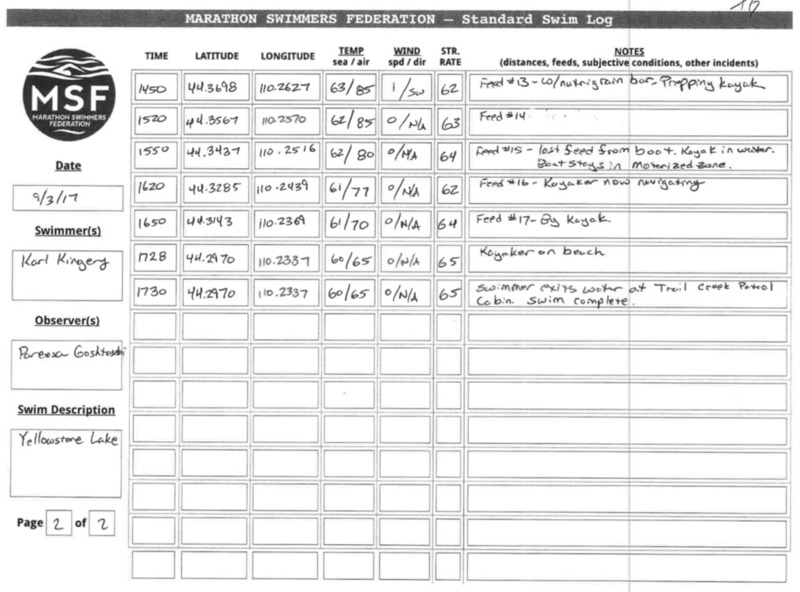 Navigating the National Park Service permits and regulations was the next logistical challenge. As this is one of the most remote parts of the United States and it is located in a national park, one of its great treasures is its silence. For this reason, among others, the Park Service imposes several motor restrictions on the lake. When within the last few miles of the lake, no motorized boats are permitted. Also, a 5MPH speed limit is imposed on both the South and Southeast Arms of the lake. While the northern lake shore is heavily trafficked by tourists, the southern and southeastern arms remain well isolated from the hustle and bustle of the lodges, campgrounds and hotel. Access for most people to these areas is only by foot, horse or boat and requires a backcountry permit to stay overnight. Your location is documented and recorded by the park rangers and you are required to watch an 18-minute video on safe back country travel. If travelling by boat, there are shuttles that run across the lake bringing hikers to and from pre-designated locations. There are also guided fishing trips and tour boats that operate on the lake. If you desire to bring your own boat (kayaks count), you must receive an aquatic invasive species check and obtain a boating permit. Additional permits are required for other activities such as photography and video which may be used for anything other than personal use. 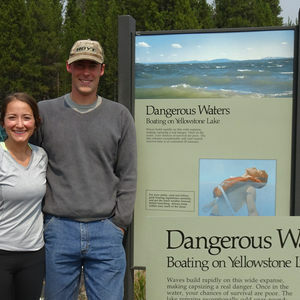 While swimming does not require a permit, according to the Yellowstone National Park Activities Guide, it is “discouraged” and furthermore, snorkeling and kayaking on Yellowstone River itself is prohibited (including around the Fishing Bridge itself). 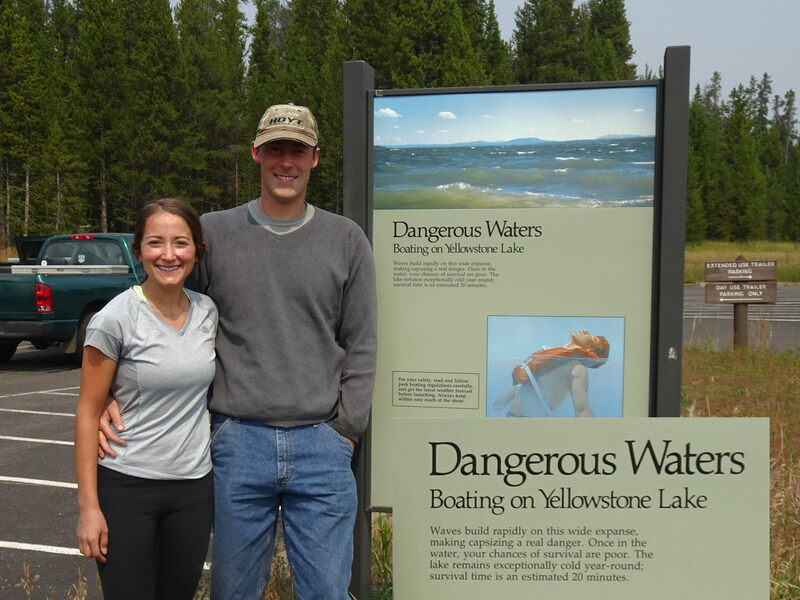 The dangers of the lake’s conditions are well documented and heavily stressed by the rangers and the National Park Service during the permit orientation. Boaters are advised not to travel more than ¼ of a mile away from shore and signs are posted at the marinas warning people of possible death in an “estimated 20 minutes” due to the cold waters. Skeptical of these claims, in 2016, I endeavored to find published papers on the water temperature of the lake, which I surmised that the NPS monitored regularly. Eventually, I found some papers and wrote to the authors. I was able to reach an employee with the National Park Service’s Natural Resource Stewardship and Science Directorate, which is part of the Natural Resources Division of the National Park Service. These folks were gracious enough to provide data on water temperatures within the lake. This data provided for some very interesting analysis. It indicated that in the early summer and fall, the water is exceptionally cold, but near the end of July and into early September, the water reaches temperatures in the high 50s and low 60s. I did not expect that I would be swimming on a 62-degree day over Labor Day weekend, but thought that if it was in the high 50s that I could make a good go at it. Regardless of the water temperature, I would be in a remarkably beautiful and pristine area of the world and it would be a wonderful experience. By the time that August 2017 had come around and I was confident enough in the boat that it could make it across the lake and back, I had spent so much time on other activities, my training had suffered, but I was mentally prepared. Hell or high water, I was going to make a go at it. Pareesa and I began our trip on Friday night (9/1/17) and drove north from Denver. Things immediately went south. As we travelled north past Longmont, a motorcyclist yelled at me through my open window that my trailer was busted. Looking in my rear view mirror, I saw that he was correct. The upright on the left boat brace had sheared off and bypassed a weld I had put in about a month earlier. It was flapping back and forth in the highway wind. No wonder the motorcyclist wasn’t thrilled. I pulled off the interstate and we spent the next two hours getting angle brackets, bolts, spare repair materials for the trailer and making the repairs. We had travelled 30 miles in 3 hours. That night we were able to make good progress up to Casper, Wyoming and spent the night at an exceptional interstate motel. It was cheap and newly renovated (So new, that the numbers weren’t yet on the doors). Inspecting the trailer the next morning, I found that a second and separate vertical brace had sheared off during the night and so I spent about 30 minutes that morning repairing the trailer yet again before we made our way out on the highway. We were fueled up by McDonald’s coffee and stubbornness. We drove through Shoshone and the Wind River Canyon and into the Park via the Buffalo Bill Scenic Byway. This was an exceptionally beautiful drive. After entering into the park, I saw that a third (and separate again) vertical brace had been sheared off and I was able to pull off on the top of Sylvan Pass. We made that repair and got our first glimpse of Yellowstone Lake when heading down the pass on the other side. Despite having grown up in Montana and having been to Yellowstone National Park several times, I had not yet set eyes on the lake. Despite the fires raging around the area, the air was remarkably clear and gave us a good vantage. Islands were spaced out across the lake and the lake stretched almost as far as the eye could see. It stretched far enough that you could make out the continental divide to the south and west, but not the boundary of the lake, which lay between. We made our way around the lake past the geothermal springs at Sedge Bay and across the Fishing Bridge and then down to Bridge Bay (not named for the Fishing Bridge but for the bridge that marks the entrance to the bay). We obtained our permits, boat slip, inspections and got our campsite set up. We had planned to meet my brother Hugh at 6PM at the Fishing Bridge. He had travelled south from Missoula to see us, have his teeth checked by Pareesa and have dinner. We stopped by the visitor’s center and then met up with him after watching some beavers swimming under the Fishing Bridge. The water was running smooth, warm (~62) and consistent under the bridge. We had dinner at the Lodge, which had an exceptional cafeteria with prime rib, pot roast, and chicken along with vegetables, beers, bread and other food. Later that night, we met up with Justin at the camping spot. We slept that evening in the Bridge Bay Campground under enough stars to see the milky way despite the campground lights. We woke up at 4:30 AM and began the morning swim prep. We boiled water, familiarized Justin with the boat, and ate breakfast. I ate an oatmeal bowl, some chicken bone broth, a cinnamon-raisin bagel and a couple of pieces of jerky. Pareesa and I then set off for the start. We dropped off the kayak, parked the truck at the visitor’s center parking lot and walked to the start. The steam was rising off of the river and the sun was just cresting over the mountains as I put on my cap, goggles, earplugs and Vaseline. It was cold enough that the lanolin I had planned to use had solidified (it was somewhere in the mid 40s) and the water was quite inviting when I stepped in. The temperature was somewhere around 60 degrees. I swam up to the buoy which marks the end of the lake and the start of the Yellowstone River with Pareesa south of me about 25 yards in the kayak. I could feel the current pushing me north, see minnows swimming underneath me, and could see many green pieces of algae floating past. I slapped the buoy and Pareesa started the GPS. The swim had begun and I headed southeast. Immediately, we knew things were not going well for Justin since he was not there, but we weren’t going to waste time, so as we approached Stevenson Island, at intervals, I stopped and talked with Justin over the cell phone from next to the kayak (one earplug was out). We were trying to trouble shoot the boat issues he was facing. He had gotten out of the marina and under the bridge but the motor had quit and the wind was blowing him towards shore. In my mind, I though “Damn it Justin, just make it go.” And I told him to just put it in gear and go after a short rest. He did and evidently, was off to the races. We had jumped in the water just after 7:00 AM and in prepping for the swim, I had accidentally spilled the one feed bottle that we had prepped for Pareesa to have on the kayak. There was about a quarter of a bottle left and Pareesa gave it to me at about 40 minutes into the swim. It was therefore not until about 8:30 that Justin was able to get to us and me, more worried about him than the feeds, felt like when he came roaring around the island, it was like something out of the Charge of the Light Brigade. The cavalry had arrived. With William Tell’s Overture playing in my head, he motored over to us and Pareesa split off to get on the boat. They had a feed to me within only a couple of minutes and I continued swimming. The fumes from the 2-stroke motor were impressive and Justin kept the boat away and behind me to avoid gassing me out. Both he and Pareesa suffered the whole trip. Both mentioned that they experienced light-headedness from the exhaust. Without a kayaker or boat to help navigate, I was forced to site on the Promontory, some 10 miles distant. It stood out separate from the rest of the lake and any mountains beyond it weren’t visible. It was a great landmark to sight off of. Every 30 minutes or so, Justin would motor up ahead of me and Pareesa would toss me a line with the feed and buoy attached to it. This system worked very well for me and I could feel the air gradually warming around me from the sun. Never was I cold, but my skin was consistently chilled, and I tried to take advantage of the short breaks to look around me at the mountains and towards the low-to-the-water Frank Island. This method continued throughout the day although one feed was missed when Justin couldn’t get the boat to work. It just so happened that this was when the wind picked up to about 5 MPH. While not a large wind, it was enough to keep Pareesa, who was far behind me and who had temporarily gotten into the kayak, from gaining enough ground in time for the feed. This didn’t bother me so much as that I was worried we couldn’t continue if the boat wasn’t working. I had tried to build in contingencies for Justin and Pareesa, but knew that the boat was not by any means running perfectly. On top of the water, there was about a 1-inch layer of water that was warm and in the north side of the lake, I could see many little floating particles in the water. As I swam south, these particles gradually disappeared and got smaller in size. This was very interesting to me because in most lakes, the particulate comes from the inlet to the lake and then settles out. Therefore, there are typically larger particulate in the upper reaches of the lake and smaller particulate near the outlet. In Yellowstone, it was the opposite and I can only conjecture that some of this particulate was from the geothermal vents at the bottom of the lake, or potentially from the large amount of people on shore near the north side. The water was quite clear, and as I swam south, mountains beyond the promontory began to emerge and present themselves. The air had been full of just enough smoke to obscure them from my view through the goggles. It was reassuring to know that we were making progress. The promontory is composed of several main knolls and is visible for a long distance. It was remarkably beautiful to swim past and its remarkable size is evident from the water. As we approached it, the mountains to my left gradually disappeared around Park Point and Signal Hills. Park Point is a grassy point to our left, which looked very inviting for grizzly bears, but Pareesa and Justin did not see any. I would later learn that on that day, I was on the wrong side of the lake for grizzly sightings, as there were three swimming in the West Arm. We passed into the southeast arm of the lake and the wind disappeared and water grew calm and glassy. I could feel the sun warm on my face and back and the temperature of the water was very pleasant. I had developed a small ache in my upper back muscles from not having trained enough and slowed my stroke rate to avoid fatigue. 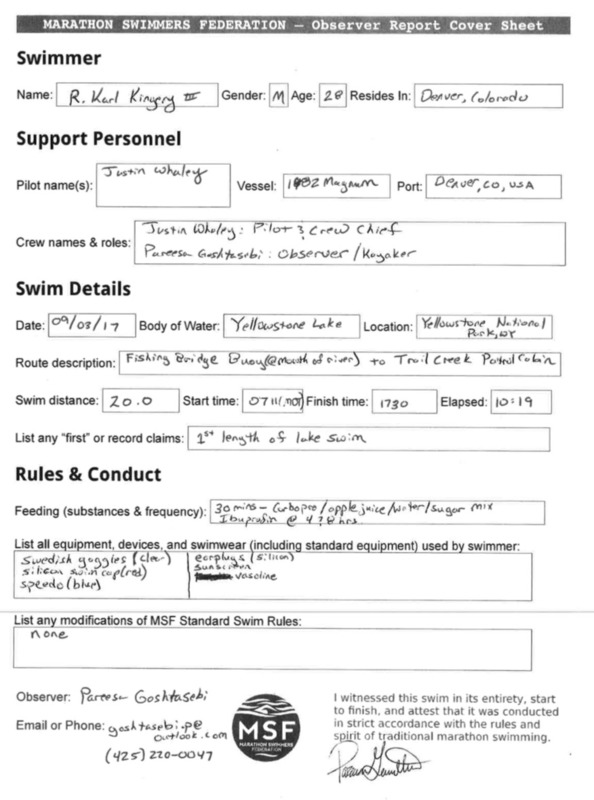 Aside from that very minor inconvenience, all was progressing smoothly and Justin at one point even hopped in and gave me an “Air 5” before swimming back to the boat. During one feed, Justin and Pareesa asked if we could finish at Justin’s campsite (5L9) and I was incensed that we would come all of the way to finish just 3 miles short of the end. They did not bring up the idea again and when we arrived at the buoy line marking the end of the motorized zone, Pareesa got in the kayak and Justin broke off to make camp. Pareesa and I could clearly see the peninsula which we needed to swim around to get to Trail Creek Patrol Cabin. It was situated right in a nook between two larger rounded mountains at the base of a smaller rocky hill. We passed around the point even though our campsite (6A3) on the tip of the peninsula looked very inviting, the finish was only 500 yards beyond, so we continued towards the cabin and finished the swim. The shoreline was composed mostly of 1-inch diameter pebbles and it was easy to walk out. The trail was right next to the finish, so after a short sit and a cursory survey of the vacant cabin site, I dressed and we carried our gear the quarter mile to the tip of the peninsula to set up camp. It was an exceptionally beautiful area that I had not been able to fully appreciate through my goggles. On the way out, we surprised a large bald eagle and we saw a heron swimming across the arm. We started a fire and attempted to boil water with hot rocks. This endeavor failed miserably as we only succeeded in making the water hot and smoky, so we cooked some backpacker’s pantry fettuccini alfredo in the coals of the fire and went to bed. As we laid down, amid the coos of the various waterfowl, I heard the sound of a single elk bugle in the distance. That night, the wind and the smoke rolled in and obscured many of the mountains we had admired the night before. We had planned to meet Justin at 9:00 AM on the edge of the motorized zone, so I suited up, we loaded Pareesa’s kayak and began the swim north. I felt strong and the weariness in my muscles quickly melted away in the cool water. It had dropped 4-5 degrees in the night and the water was around 59 degrees. Again, the water was warmer than the air and getting in was quite pleasant. I was worried that Justin would not be able to start the boat in the morning, but he was waiting right on the line for us, so after 3.5 miles and 75 minutes, we arrived at the boat. After a short stop at Justin’s camp to reorganize and re-situate the boat, we motored back to Bridge Bay Marina across the lake, passing a several charter fishing boats, a sailboat and a park service boat. Justin drove me back to my car and my parents surprised us by showing up at the dock just as we were taking the boat out. We ate a very delicious lamb-burger and bison-burger lunch at the hotel (which just so happens to be the oldest operating hotel in the national park service) and made our way back to Denver. On the way back, we made a short stop at Hell’s Half Acre. All told, the trip was a success and the swim was very enjoyable. Many thanks to the perseverance, knowledge and patience of two of the most giving and capable people in the world. Justin and Pareesa really made this adventure both fun and successful.